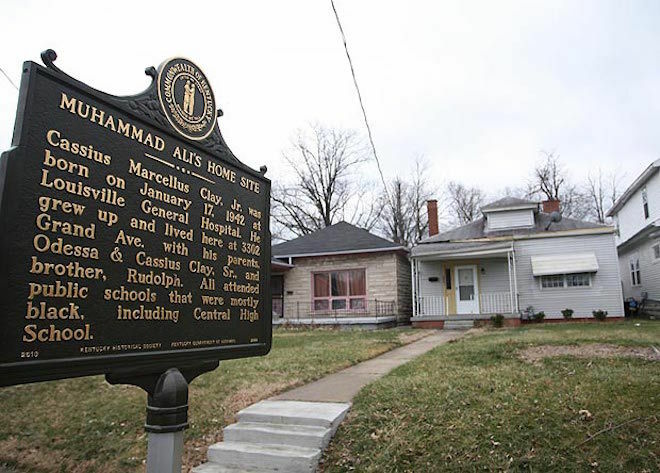 One day in 1954, a young Cassius Clay, fuming about his stolen red Schwinn bike, ran in front of his family’s five-room house at 3302 Grand Avenue in Louisville with tears in his eyes and screamed that he’d whup whomever took his ride. Down the block, police officer Joe E. Martin heard his neighbor making noise, and decided to make him an offer. If you plan on whooping anybody, he supposedly said, you better come down to my boxing gym and learn to fight. From that day on, the future heavyweight champ was a fixture at nearby Columbia Gym. Dan Riedemann may work with a hammer and nails instead of a laptop, but he sees his job as helping bring those kinds of stories to life. 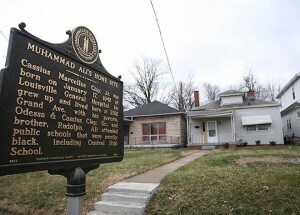 A homebuilder and restoration expert who owns 19th Century Restorations, which specializes in rebuilding historic homes such as the Iowa home where Johnny Carson grew up, he just begantransforming Ali’s childhood home, abandoned since 2012, into a museum celebrating the champ’s life and exploits. Much like Riedemann’s niche operation, he says these homes, and the work to restore and preserve them, offers a uniquely American story. The Ali home before major restoration work begins. Riedemann traces his obsession over historic homes to his childhood, and a 1920’s English Tudor in Des Moines. If there’s a vintage gene, he has it. While all his friends were looking for new bicycles, he sought out the rusty banana seat Schwinn to restore. His grandfather, a homebuilder and a carpenter, spent weekends his grandson, showing him how to build homes. But that Des Moines house, where he spent the wonder years of his childhood, had a lasting impact, and when his family had to move away when he was in the fourth grade, he was crushed. He believes that all the restoration work he’s done since has been his own way of staying connected to that home. “When you look at an old car, every scratch and ding tells a story,” he says. “I just became fascinated with old houses, the older the better. Not literally, of course, but you can hear the voices of all the people that have lived there talking to you. All the decades of history have so much meaning, much more than a sterile, new home. Riedemann’s professional interest in the construction trade started in high school, when he spent summers framing homes. A few years after school, he was doing general carpentry and construction as Riedemann Construction, and then started working on renovations in Kansas City, building additions or carriage houses for historic homes in the stately Hyde Park neighborhood. By 2005, when he had changed to 19th Century Renovations (he felt a rebrand would make him stand out and lead to bigger jobs), he was working in Lawrence, Kansas, finding success building high-end homes that mimicked century-old designs. But constructing homes at $750,000 a pop, decked out in Italian marble and Parisian chandeliers, wasn’t feasible when the market crashed, and Riedemann felt he wasn’t really following his passion. So he started scouring the internet for historic homes with a story. Vintage photo of Johnny Carson’s childhood home. In-progress photo of the Johnny Carson’ restoration. Riedemann standing outside Johnny Carson’s birthplace in Corning, Iowa. Riedemann’s first big celebrity restoration was Johnny Carson’s childhood home in Corning, Iowa. He reached out to members of the Johnny Carson Birthplace Society in 2012, showed them his portfolio, and set to work. The six-month project set a template for how he would work going forward; contact family and neighbors for photos and memorabilia, conduct interviews with anybody who has visited the home, and then scour the internet for old furnishings and electronics. Many of these smaller homes can be restored for as little as $75,000 if there isn’t much structural damage, and when finished, they can become the cornerstone of a small town’s identity. Riedemann became involved with the Ali project after seeing the property was for sale in 2012. After placing a bid on it, he discovered he was the second in line for the home, and once the eventual purchaser, Las Vegas lawyer Jared Weiss, became public, Riedemann reached out a presented a plan. Along with a group of investors and boxing fans, the plan for the property is to create a home museum on site, eventually expanding to two adjacent lots the group owns, which will include a garden and additional parking. Interior photo of Nina Simone’s childhood home. Plaque outside of Simone’s home, referencing her birth name Eunice Waymon. The current plan is to open by mid-September when the Muhammad Ali Humanitarian Awards, held at the Ali Museum in Louisville, will bring both the champ and the media to town. So far, Riedemann has spent about a week on site, scoping out the home, assessing the structural damage, and figuring out what’ll happen when he removes the aluminum siding. Restoring it to its 1954 origins, a pink five-room home that included an art and play room Ali’s father added so he could paint, should be relatively easy. When the champ moved his parents to a larger home, the literally opened the doors and told neighbors to take whatever furniture they wanted, so a handful of the original pieces have already been located. Riedemann’s next restoration projects include Nina Simone’s birthplace in Tyron, North Carolina, and Woody Guthrie’s birthplace in Okemah, Oklahoma. He’s been in talks to begin work on both sites, but currently, supporters need to raise more funds to get started. Riedemann has already started work, immersing himself in books and writing about the subjects. Woody Guthrie’s childhood home in Okemah, Oklahoma. A local news report on Dan Riedemann’s efforts to restore Woody Guthrie’s childhood home. One of 19th Century Restoration’s Residential projects, a gambrel-roofed Victorian in Lawrence, Kansas.